I was astounded a couple of weeks ago to find some very inexpensive blood oranges. Instead of devouring them as I did with the first couple of bags I bought, last week I decided to make some marmalade from them. Making marmalade from any kind of citrus is easy: Weight the fruit and cut it up, saving any trimmings and seeds to tie in a piece of cheesecloth. Add double the weight in water and bring to a boil; simmer 1 hour. Cool overnight. Next day, weigh the fruit and water mixture and add an equal weight of sugar. Cook to 222 degrees and pack in sterilized jars... That's it! Here's a more elaborated version with a few hints for making the process easier. Trim the ends from the oranges; halve them or quarter them if large. If they are seedy, cut away the central piece of pith and pop out the seeds. Put any trimmings and seeds into a bowl lined with cheesecloth. Put the sliced fruit into a 7-quart enameled iron Dutch oven. Add the water and tie up the cheesecloth w the seeds in it and add (photo above). Cook for an hour, then cover and leave overnight. Don't bother skimming until the marmalade is completely cooked. Stir occasionally to make sure nothing is sticking to the bottom of the pan. 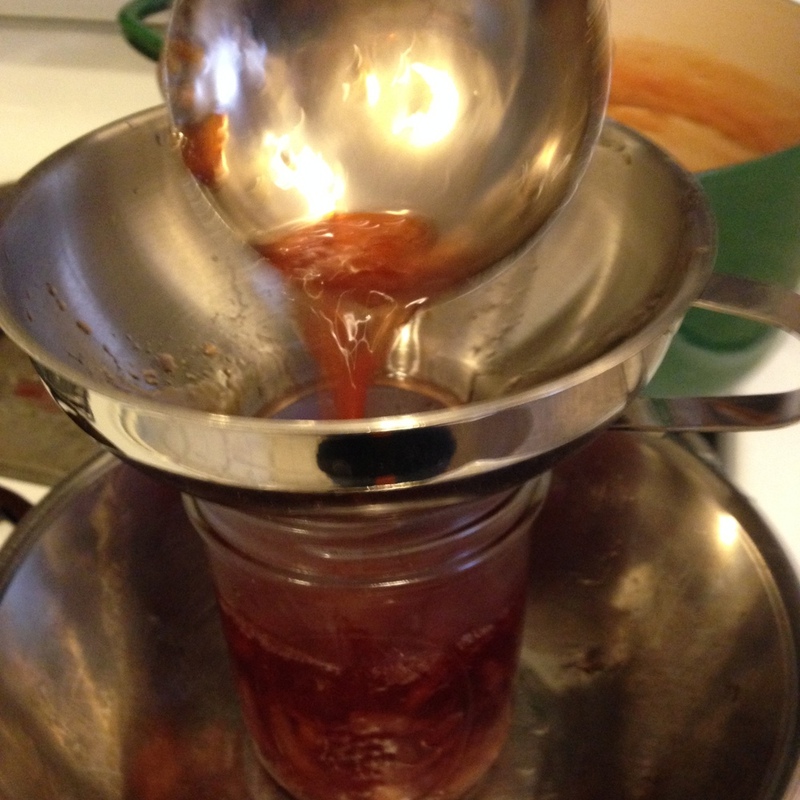 Cover with a sterilized lid and hold the hot jar using a pot holder to tighten the lid. Cool the jars. As these have not been pressure canned in boiling water, the marmalade should be stored refrigerated.